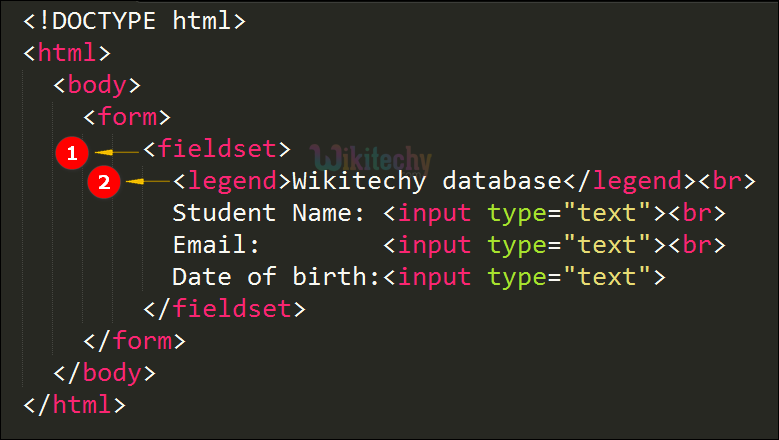 The <fieldset>tag is used to grouping the related form elements. The <fieldset>tag is used to draws a box around a related elements. Using the <fieldset> tag, you can create your forms and your users are easily understand. And the legend tag also same as the previous point. Not supported in HTML 4.01. The <fieldset>tag is used to group a related elements to form and text boxes are declare for the related elements. The <legend>tag is used for the caption of the data in fieldset tag. Here the output displays the text boxes for the elements by using the <fieldset> tag. form form_id No Yes It specifies one or more forms which belongs to fieldset. name text No Yes It specifies a name for the fieldset. The <legend>tag is defined as a caption for the <fieldset>tag.